Two years ago we posted a delicious orange cocktail recipe perfect for your Clemson tailgate. Recently we've seen it pop up all over Pinterest, so we decided to hunt down another refreshing cocktail recipe that would be easy to make and serve at your tailgate. Sip responsibly and enjoy! Combine all the ingredients and shake with ice. 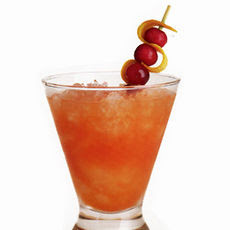 Strain over finely crushed or shaved ice in a Collins glass. Garnish with the cranberries and orange twist.